If you're a regular reader of this blog you probably know that I love to run. It's one of my biggest passions and fortunately it's been an easy passion to maintain in Central America. 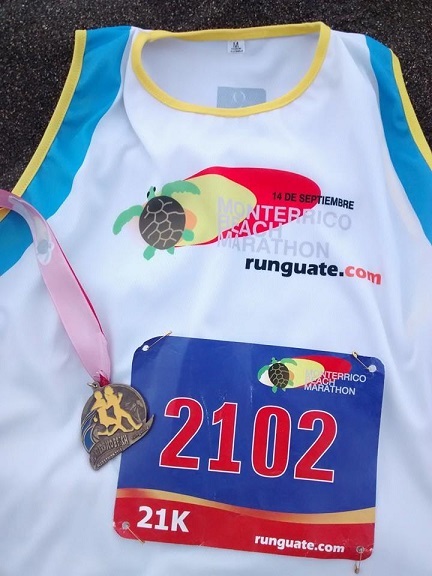 In the past year, I've run four Half Marathons (three in Guatemala and one in Costa Rica) and unofficially one 5K with my son in Guatemala. In the States you typically go to the website for a race, click sign-up, enter your credit card and boom, you're done. It's generally not that easy south of the border. Most races don't have websites and those that do are often out of date. They will frequently publicize a race that occurred 2 or 3 years ago...seriously. The best thing to do is to search for a particular event on Facebook. Once you find it you'll often see what bank the race is affiliated with. You then go to a branch of that bank and using an account number that was published on Facebook you ask to pay or deposit money for the race into that account. It seems weird but it works. The cost for Half Marathon's in the States are typically $60-90. If they charged that much down here no one would show up. I've paid between $18-$40 for the races I've run. 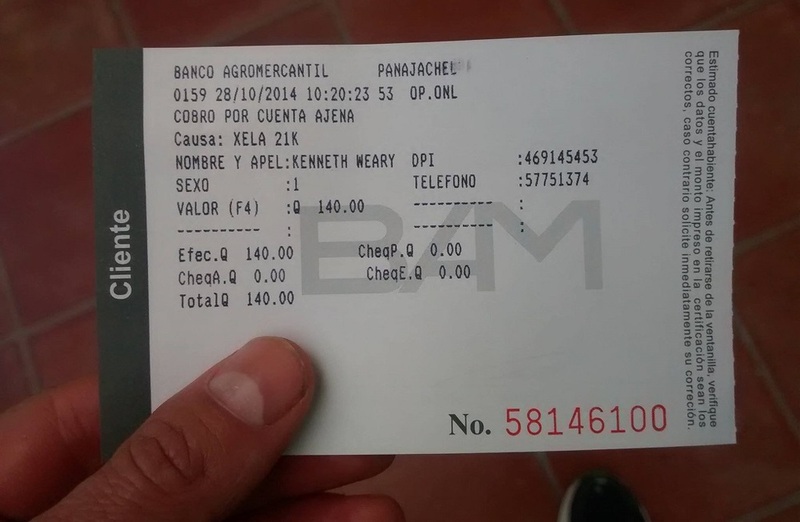 The $40 race was in Costa Rica, the races in Guatemala were $18-$25. If you're thinknig that's too cheap for a quality race think again. All of the races I've run have been up to US standards with regards to onsite medical support, refreshments on and off the course, a race t-shirt, a swag bag, medal, etc. How do they do it for so little money? My best guess is the lack of insurance by the race organizers. Many race directors in the US will tell you that a good chunk of the registration dues goes directly to paying for insurance that was required in order to protect themselves from the worse case scenario injuries. Insurance is not a common thing down here. It's much more of a Darwin like mentality when it comes to things like this. Like many things in Central America planning details are sometime overlooked or might just be a last minute thing. I've had to scour Facebook the day before the race expo to find out where it was taking place (literally they publish stuff like this hours or only a day before). 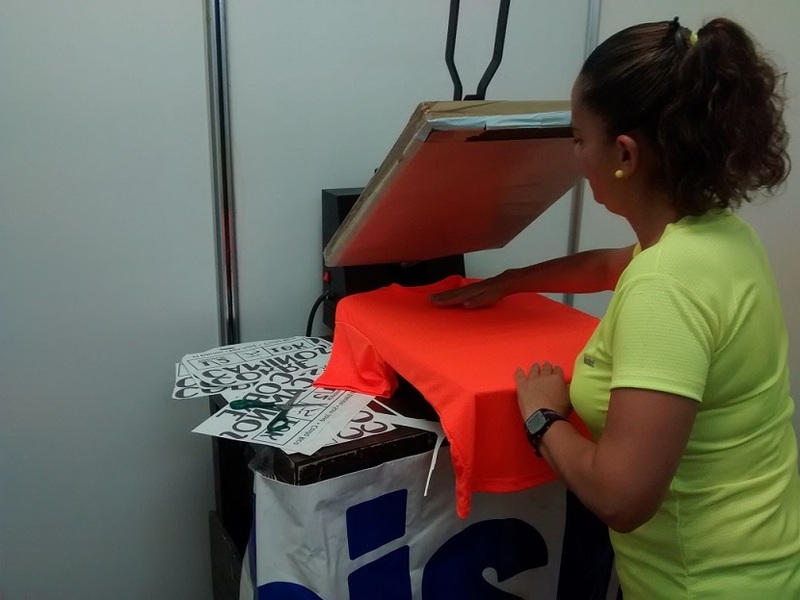 It's also not uncommon to show up to pickup your bib only to find out that the race organizer forgot to get pins to secure them onto shirts (this happened at a race with more than 3,000 registrants). Hot off the presses. You want you your race shirt? Give me just a second. The further South we go the earlier races seem to start. This is super important in order to beat the heat. One race I ran started at 5:15 AM. The funny thing was it was started after a slew of fireworks were shot off. I'm sure the neighborhood loved that. Another race started at 6AM but the beginning was 13 mile outside of town. The race provided free shuttle buses to the start that picked us up at 4:30AM in the middle of downtown San Jose, Costa Rica. Top Pic - Runners waiting for the shuttle bus in downtown San Jose, Costa Rica at 4:15AM. Lower Pic - Runners stretching near the start an hour later. If you're the shy type, you might have trouble running a race here. I've not run a race that had porta-potties on the course. There has always been some at the start and the finish but if you need to go mid race you're going to have to find a tree, wall or bush (sorry ladies you'll need to squat). Perhaps this is why the swag bag in San Jose included a roll of toilet paper? When running a half marathon in the US you encounter a table of refreshments (usually water or Gatorade) roughly every 2-3 miles. While frequency of these stops is similar in the Central American races I've run the medium is different. There are no cups. 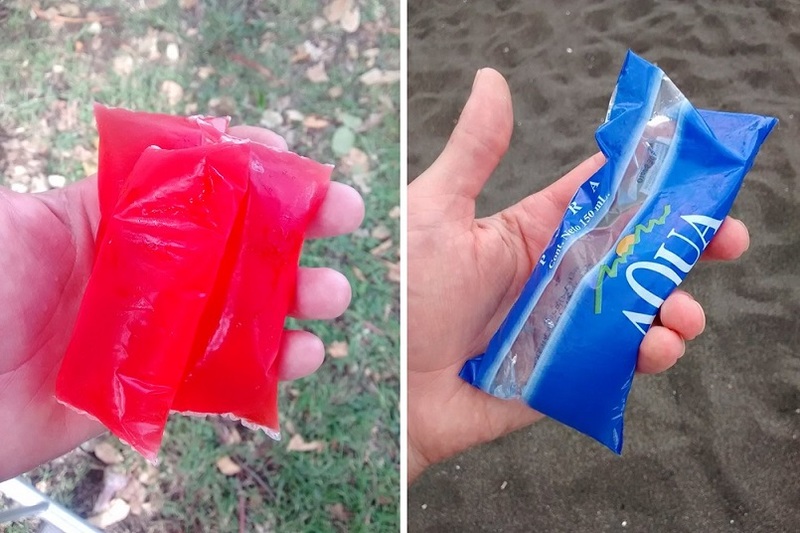 All of the liquid is given to runners in sealed plastic bags. You have to bite the corner off in order to take a drink. I LOVE this! I've learned to pick up an extra water bag when I pass the tables and use it to cool off when I need it. It's also great if you're not thirsty right away. You drink it when you're ready. No worries with spilling your cup when someone bumps into you. Sealed bags of Gatorade and water. These need to be adopted by all races worldwide. They are awesome. Every race I've run has been in a different city/town. This has allowed me to see more of the local streets, neighborhoods and even some culture. 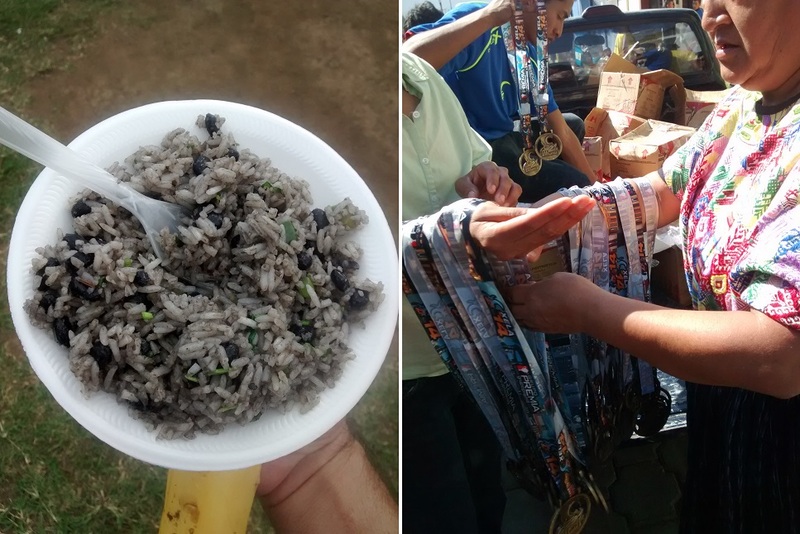 The post race food in Costa Rica featured a favorite local dish commonly referred to as "Gallo Pinto". Essentially it's a dress up rice and beans that includes onions, cilantro and spices. It's a great dish. In one of the Guatemala races it was impossible not to notice the local Mayans in their traje (traditional clothing) supporting the race. Left: The Gallo Pinto (commonly called just "pintos") were delicious! Right: Note the Mayan traje on the woman handing out the medals. A lot of events in the States have "Kids Dashes". They are shorter runs or sprints designed to get kids interested in the sport. I've not encountered such an option here but that did not stop Tag (our 6 year) from registering for his first 5K. Left: Tag sporting the smallest race shirt the organizers had available. Right: Tag and I running his first 5K. The organizer let me run with him for free. Running is a part of me. I try to do it as often as I can. I hope to run more races as we continue our journeys...and hopefully stay clear of hornets.